Why Is Our Flexible Curtain Track So Popular? We’ve got a special track that is searched for more than any other we offer: the 6100 Flexible Curtain Track. We are not surprised it is so popular. Why? Where should we start? How about quality? 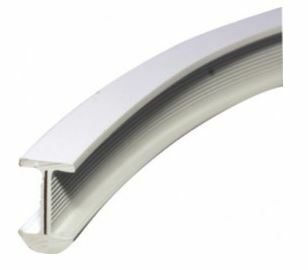 Our Flexible Curtain Track is the highest quality flexible track on the market. It is a durable I-Beam track made of white PVC with an internal metal spine that will last decades if installed properly. Easy to use? These tracks are stored in coils of 98 feet or more. You can have a whole coil if you like, but we are happy to custom cut tracks to fit your project perfectly right out of the box. No special tools are necessary to bend it. It can be easily bent by hand without compromising strength. Installation is easily done with the right drapery hardware, such as cartridges and brackets, and this track can even be installed onto a drop ceiling without drilling a single hole with drop ceiling clamps. So the flexible curtain track is easy to install and high quality. Is it useful? Very – it can be mounted on walls or ceilings and used as a straight, run-of-the-mill window covering track, or can be bent into any curved or angled shape, as needed. They are great for bay window curtains, but can also be used to create a retail changing area, or go around a claw-foot tub. Two parallel tracks can be installed on the ceiling or wall, for hanging a sheer and a drape, or a shower curtain and a liner. Our flexible curtain track has been used to cover storage areas and water heaters, create a closet, and give some privacy to cubicle space, among many other uses. Our customer service reps want us to point out that this track comes in standard, medium, and heavyweight strengths. This is important because each has its sweet spot of application. Our reps stress that the standard-weight track is for light curtains only – think a sheer or small valence. Most other needs in the home, like window treatments, shower curtains, room dividers, etc., will require the medium-weight track. For commercial applications, such as heavy drapes, virtual walls, retail backdrops, etc., the heavy-weight track is necessary. Visit us on Pinterest to get more ideas for using the flexible curtain track.